Dan Westwood – clearly over the moon to have joined up with Khalsa. 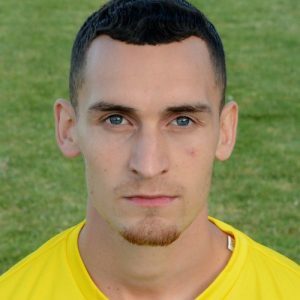 Prolific goalscorer and record-breaker Dan Westwood has become the latest player to join the ranks at Sporting Khalsa ahead of the 2018-19 season. Westy is now in his second spell for Sporting Khalsa and hoping to grab the goals to fire the club to glory. Since his short-lived first spell at the start of the 2015-16 season, Westy has become something of a celebrity in non-league circles, firing over a hundred goals in two seasons for Wolves Sporting (including a pearler of a free-kick against Khalsa in the JW Hunt Cup final at Molineux in 2016). His exploits included five successive hat-tricks, believed to be a world record, which led to a mention on Match of the Day. Westy spent last season with Telford and Stafford Rangers, continuing his goalscoring exploits before returning to the Aspray Arena for the 2018-19 season. 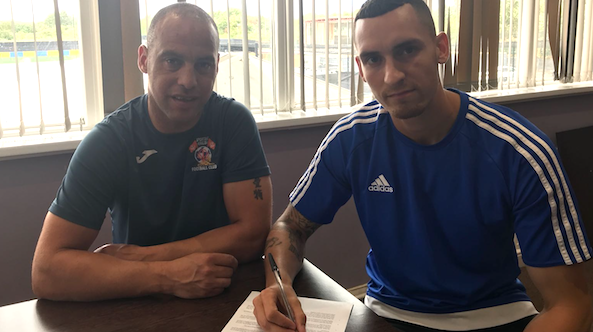 He joins other confirmed signings including Tony Clarke, Alex Perry, Garfield Robinson, Dale Reaney, Ryan Pratt, Rico Taylor, Kieron Miller, Lee Butler and Lee Chilton. Delighted Khalsa boss Ian Rowe said: “I’m made up we’ve managed to get this signing over the line and want to thank everyone who’s worked to make it happen. “There’s no other way to put it: Westy equals goals. He loves scoring and the only thing he loves more than scoring is scoring again. Westy made his first appearance in Khalsa colours of this spell in today’s 4-1 preseason friendly win over Punjab United.